"If you had told me at the time I'd learn to love the super bitter green enough to eat a whole salad bowl full of it, I'd call you crazy. This simple parmesan vinaigrette is so good, it'd make you a convert to just about any "icky" food you put it on." When I was little, I used to pick the "icky" bits of radicchio out of the salad mix my mom would serve with dinner most nights. If you had told me at the time I'd learn to love the super bitter green enough to eat a whole salad bowl full of it, I'd call you crazy. This simple parmesan vinaigrette is so good, it'd make you a convert to just about any "icky" food you put it on. 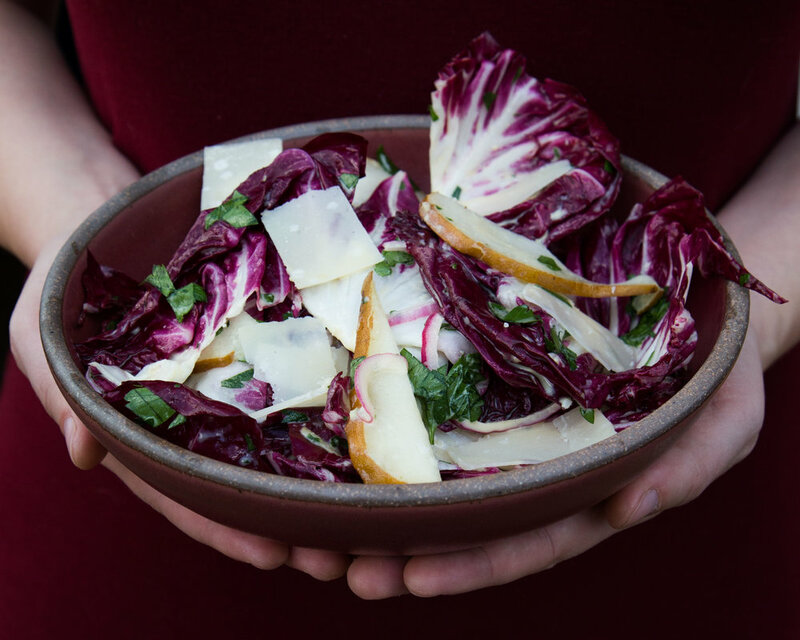 Radicchio is the perfect complement - the sharp, tangy vinaigrette mellows out the bitterness in a nice, unexpected way. First, make the vinaigrette - add the parmesan, garlic and lemon juice to a food processor. Pulse until garlic is pulverized. With the motor running, slowly drizzle in the olive oil. Season with salt and pepper to taste, and set aside. Remove any bruised outer leaves from the radicchio. Separate the remaining leaves in place into a large mixing bowl along with the pear and chopped parsley. Toss with the vinaigrette and taste for seasoning. Separate into individual bowls and top with shaved parmesan.